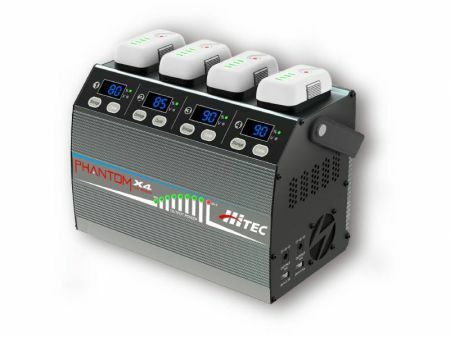 The Hitec Phantom X4 Charger is a four-channel battery charger designed and built exclusively for DJI Phantom 3 and Phantom 4 Smart Batteries. This charger is capable of charging, storing, and deep cycling four batteries simultaneously. One year limited warranty through Hitec beginning at date of purchase. Note: Adapter part #61116(not included) is required to charge Phantom 4 Smart Batteries with this charger. Add one or two pairs from the drop-down menu on this product.